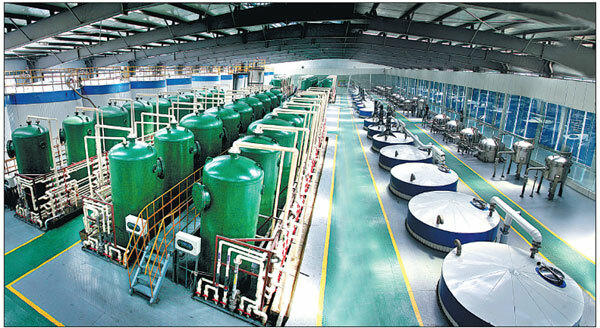 Xiwang Group spent 11 years and over 1 billion yuan ($151.27 million) developing corn fructose. In their studies, the disposable crystallization yield rate of corn fructose hit 50 percent. The company's success broke other countries' monopoly on fructose production, enabling it to become a leading Chinese company in the field of corn processing technology and large-scale fructose production. Besides corn fructose, Xiwang also focuses on the production of healthy corn oil. Through its innovative production methods, the cost of the production of corn oil and fructose has been reduced to the same levels as that of other common forms of edible oil - such as peanut oil - and white sugar. Attracted by its low cost and health benefits, the company said a group of consumers decided to change their daily intake of sugar and edible oils, instead benefiting from the healthy effect of products made from corn. In September, Chinese government officials from the National Development and Reform Commission and the State Administration of Grains visited Xiwang Group and approved the firm's trial in developing corn oil and fructose. Company Chairman Wang Yong said his group would continue to focus on health and its push to make Chinese fructose a high-end brand - filling a gap in the domestic fructose market. Last year Xiwang Foodstuffs Company, a unit of Xiwang Group, agreed to buy Canadian vitamin manufacturer and sports nutrition company Iovate Health Sciences International Inc - owner of nutrition supplement MuscleTech - for over $700 million. Based on the expertise in healthcare nutrition and equipment accumulated by the two companies, they worked together to develop a new product and supply chain to tackle the Chinese market. Several months after the acquisition, Xiwang said it increased its rate of market growth in the Chinese market, with their muscle nutrition product, by more than 100 percent. Xiwang Special Steel, another subsidiary of the Xiwang Group is also growing its business, paving the way to upgrading its steel products. The company, set up in 2003, operates an integrated production process from steel smelting to secondary metallurgy, continuous casting and steel rolling. Its products consist of steel primarily used in buildings and infrastructure, as well as special steel that is used in automobiles, boilers, and pipes machinery and equipment. In 2014, the company kicked off cooperation with the Institute of Metal Research of Chinese Academy of Sciences, with a project to develop a special steel demonstration production line for high-end clean and smart equipment. As the first production line in China in this area, the project has developed about 120 new varieties of special steels. Among them, there are more than 80 high-end products, which can be widely used in transportation, marine engineering, energy, the power sectors or the petrochemical industry. According to Zhang Liancheng, deputy-director of the technology division in Xiwang Special Steel, the company has been working on the special steels used in high-speed railways, trains and freight cars. This, he said, has provided strong support for the overall transformation of the high-end equipment manufacturing industry. In line with its continuing moves to develop high-end special steel, the company said it is attracting top staff. As part of that process, it set up a railway special steel laboratory and a workstation for Chinese academicians. To expand the Chinese market, the company also provides products for the civil military integration industry. In order to meet the needs of Chinese economic restructuring - and closely following national strategic planning - Xiwang said it is gearing up to expand its brands and explore overseas markets, as well as to strengthen capital management. It announced a development plan for 2018, in the form of a mission statement for the period 2016-2018. In it, the company plans to boost intelligent production and capital expansion. It also plans to accelerate its industrial upgrading by supporting the growth of small and medium-size subsidiaries and bringing in more top-quality employees. "I have the confidence that Xiwang villagers will become the happiest villagers and our working staff the happiest workers," said Company Chairman Wang Yong. "We will strive to create a new Xiwang out of the current company in the next five years," he said. "By then, our total assets will exceed 100 billion yuan ($15.4 billion), annual revenue 100 billion yuan and annual profits 10 billion yuan," Wang added.